Oh my gosh you guys! The Bachelor had me stressed beyond belief this past episode! Like I need recovery time from this whole ordeal. Between new locations, Krystal's general Lana from Princess Diaries craziness, and age reveal conversation that left me shook...I need a nap. But here's what you missed on last night's episode of The Bachelor. 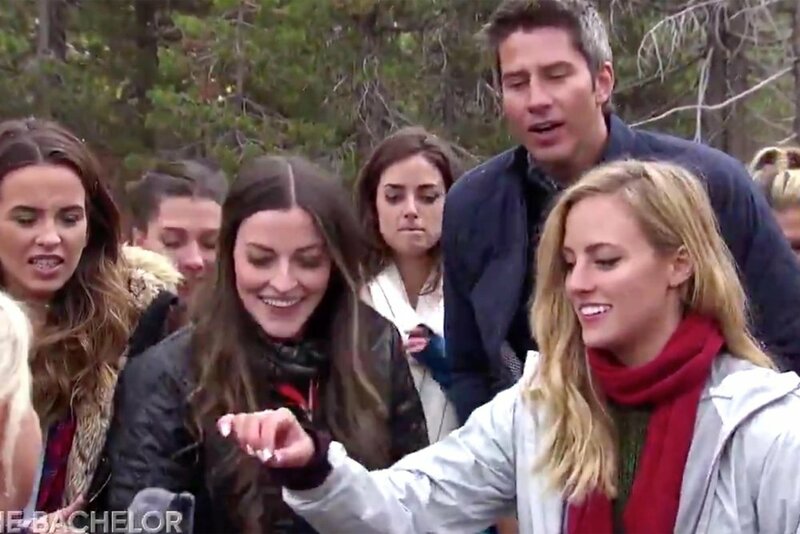 The girls and Arie take their epic foolishness to Lake Tahoe (literally one of the most beautiful places) in efforts to see if any of them have a true connection with one another. Krystal is of course up to her usual antics and doing the job of inflating her own ego while everyone else rolls their eyes...because she's the worst. She basically accuses everyone, in her baby-stripper voice, that they are too immature for him and that she's the only one that Arie wants, blah, blah, blah, delusion, delusion, delusion. Besides that, the topic of Bekah's age comes into question as we all wonder whether she's told Arie that she's 22 yet (plot twist she hasn't). Also during this time, we were super confused why Arie had checked into the Hard Rock hotel, like what? I think it's because he blew all of his money on the first date...where he bought a chick designer shoes. Also, taxidermy girl, Kendall (?) was in her freaking element in their little wood cabin like she was here for all of it. MOVING ON! The first one-on-one date goes to...SEINNE! If you need a reference to who she is, please see the picture. She's probs one of the most eloquent girls on the season as well as being super grounded, self-assured, and gorgeous. She's basically the best! This, of course, means that Krystal and FIC (First Impression Chelsea) are not happy about this turn of events. On top of that, everyone is freaking out because the last time that there was a one-on-one, the girl got sent home (RIP Lauren S.). But just because that happened, doesn't mean that's every one-on-one. Once again though, Krystal showed her true shady colors by basically saying on national television that Sienne is gonna go home on this one-on-one. I say again...she is the absolute worst. Despite the worry and general witchiness of the group back at the cabin, Seinne and Arie actually have a great date. My only general concern about it was the fact Arie has like the conversational skills of a 12-year-old boy, and it makes me cringe. Like there have to be other ways to describe something as being "really cool." Also, like is it me or does he not like...give a ton to the conversation. IDK sometimes it just feels like pulling teeth to get him to say something. Nevertheless, Seinne showed herself to be the truly amazing woman that she is, by talking about not only her perception of love being hard but expressing how for a black woman, it has been hard for her since she didn't see girls, that looked like her, getting a "happy ending." We high-key cried, and you could just see the realization of newfound wokeness on Arie's face. After that whole divulgence of everything, they walked into a concert area, where some random, white, twangy, male, country singer serenaded them as they danced among a crowd of Bachelor obsessed drones. All in all...a good date. Back at the cabin, unfortunately, one of the girls, Maquel, ad to head home after receiving news that her grandfather passed away. We hope that she and her family are doing well, and you would think that this would maybe tamper down some of the foolishness this week...but you would be wrong, it was just the start. As the group date was announced, it turns out that our sweet little 22-year-old Bekah would get the coveted, second one-on-one date with our Bachelor, a fact that increased Krystal's pettiness levels about 200% and made FIC feel that she wasn't doing so hot in the playing field for Arie's affections. On the group date, the girl's prepared themselves for a wilderness hike. Which like nothing says romance and falling in love like learning how to survive in the wilderness (Literally one girl almost drank her own pee for love before Arie stopped her, if that ain't dedication idk what is). Krystal was in fine, baby-stripper form as she whined insessantly over the fact that she was on a group date, and other girls were taking up "her" time with Arie, and she was uncomfortable and just whatever else she was saying. Like honestly we just tuned her out becasue she's annoying af. While this was happening, all the girls + Arie were split up into groups for like a nature hike to find hot tub sauna. Once everyone made it to the sauna, it was all pretty chill...until Krystal felt personally attacked for whatever reason by Tia (aka my favorite) and Caroline, all because they were doing some harmless teasing at Arie and her when in the hot tub. Honestly it was ridiculous. Krystal did her whole fake cry/insecure bit to Arie (who seemed literally so deeply uninterested in it all) and then tried to confront Tia and Caroline about their apparent insecurities about her. Tia was not having it, and did the best thing she could have done. She walked away talked to Arie, and got deeper into their relationship rather than focusing on psycho Krystal. In the end, Tia got the group date rose (Hallelujah!) and Krystal had her typical murderous smile on for when things don't go her away. Honestly it's frightening. "Don't you know how old I am?" This whole thing is already complicated enough without y'all making me it even more so. But any way it's the end of the date, and Bekah finally tells Arie how old she is, and this begins the most real talk, smash my heart, made me and my best friend cry, moment of The Bachelor. Like the conversation the two of them had...nothing will ever rival it. We forgot that this was like a tv production it was that wild. In the end Bekah got the rose, but Arie is defs more aware of her age and his intense feels for her. Like honestly I'm trying to pick up my feelings after witnessing this conversation. Like yo girl was STRESSED. So finally it's the end of the episode and surprisingly Arie does not want a cocktail party to occur. Which like after you just had the most real convo...ever...I'm pretty sure you have to know what you want. So anyway, Krystal is freaking out, as per usual, and stops the entire rose ceremony to pul Arie aside. Meanwhile, literally, everyone just sits on the floor because they are exhausted with her BS (like me too). They came back and Krystal gets a rose (UUUGGHHH)! And that's basically what you missed on The Bachelor. If Seinne doesn't end up with Arie, then she and Peter should get together, because they would be super cute! A ton more happened, and there will be a ton more to come (including Krystal apparently going crazy in the next epi) so stay tuned for your fill of The Bachelor.